In my last post I introduced you short history of tartan. Today I would love to show you how you can wear it. 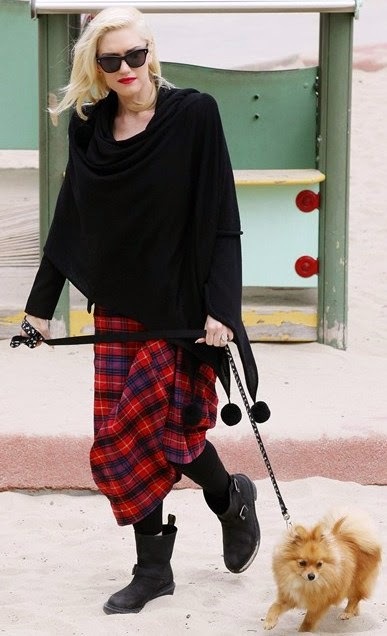 In the post I would love to give you some advices about how you can wear a tartan skirt. So how to style it? It's all about what you like school look, retro, grunge or punk trend. 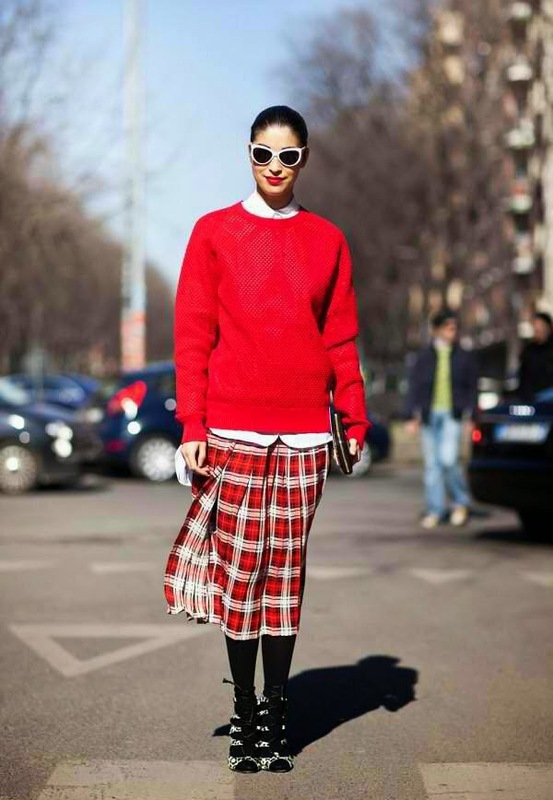 I would recommend you to look for short/midi pleated A-line skirt or midi pencil plaid skirt. That will look great with a basic plain color sweater, cute cardigan or 60's inspired coat if you love classic. If you want something stronger pair it with T-shirt with a cool print and biker jacket, or even such a trendy in this season faux fur. There are no shoes you should not wear, it will look great with boots as wells as with loafers or creepers. All depends how much you like to play with your style. If you decide you to mix it with other print I would rather recommend to mix it up with another tartan print, but be careful, it can be too much. In my look I have decided for a modern preppy and a bit retro inspired look. I wore cute a mohair pink sweater from Topshop, classic white shirt from Marks&Spencer paired with pearl necklace, tartan skirt and transparent rain coat from Primark. I give it retro touch with salmon pink boots, which I found lately in Topshop. These pictures I have made in my hometown Warsaw, because I wanted to show you beauty of my city. Here one of my favourite places, Old Town. Hope you will enjoy this post! En mi último post os conté corta historia de tartán. Hoy me gustaría mostraros cómo podéis combinarlo, centrando me particularmente en la falda de tartán. Entonces, ¿cómo usarla? Todo depende de lo que te gusta, prefieres estilo preppy, retro, grunge o tendencia punk. Sea cual sea eligiendo una falda tartan apunta por buscar una version mini o midi en version lápiz o plisada. Si te gusta estilo clásico combinala con un jersey básico monocolor, un cardigan o abrigo estilo años sesenta. Si quieres algo más llamativo ve por estilo grunge o punk y atrévete ponerla con T-shirt rockero con chaqueta biker o aun mejor una chaqueta de piel de imitación. Si te decides combinar la falda con otro estampado, hazlo con cuidado y más bien decidete por otro tipo de tartán. Mi propuesta para hoy es un look inspirado en preppy y retro. Llevo un suéter rosa de mohair de Topshop, clásica camisa blanca de Marks & Spencer emparejados con collar de perlas, falda de tartán y abrigo de lluvia transparente de Primark. El toque final le dí con mis color salmon d eTopshop. Para los curiosos estas fotos me han hecho en mi ciudad natal de Varsovia, porque quería mostrarle la belleza de este sitio. Aquí uno de mis lugares favoritos, el casco antiguo. Świetna spódniczka, poluję na taką! This outfit is really cute and I find the raincoat really fun! The skirt looks great with the pink sweater! I love tartan!! Its soo hot right now! It looks gorgeous! The transparent coat is really cute! Suits soo well! Hola Aga!!! nice skirt and love your rain coat!!! Love you rain coat ! !